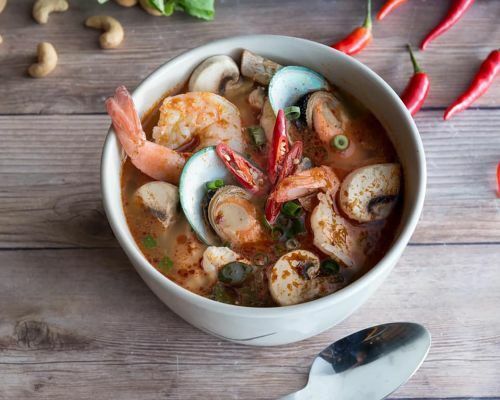 Menulog delivers for Red Spoon Thai Cuisine so you'll be able to track your courier on a map. With tossed garlic and salt. With option for seasonal salad or sweet and sour spicy sauce. Grilled beef with a side of chilli sauce. Grilled marinated chicken with a side of chilli sauce. Grilled marinated pork with a side of chilli sauce. Broad rice noodles with chilli and basil sauce. Broad rice noodles with dark sauce and oyster sauce. Broad rice noodles with cashew nut sauce. Hokkien noodle stir fried with your choice of chilli and basil sauce or with oyster sauce. Thin rice noodle with curry, coconut milk and vegetable. Calamari with green herbs and mixed leafy green, mild chilli with dressing. Chicken feet boneless, onions, coriander and fresh herbs. Green herbs and mixed leafy green, mild chilli with dressing. Chunchy rice with cured sour pork herbs and peanut. Raw beef salad with tripe, anchovy, lemon juice and fine roasted rice. Seafood with green herbs and mixed leafy green, mild chilli with dressing. Duck minced with green herbs and mixed leafy green, mild chilli with dressing. With onions, coriander, salad and fresh herbs. Pawpaw with fresh garlic, anchovy, tomato, lime juice and chilli. Pawpaw with fresh garlic, tomato, lime juice , chilli, palm sugar and peanut.